¿Chocolate turtles with a nut and caramel filling? I register at the forum some time ago and visited him constantly, now I have decided to participate and would like to ask your help. The other day my niece to buy them some chocolate turtles with a whole nut and caramel filling, my niece loves this chocolate and I come with you to ask your help, anyone has the recipe to develop them? I was grateful if I can provide guidance on their preparation. Excuse my English, but I am learning this language , greetings from Mexico! Welcome Filipe. That's a very cute chihuahua in your signature. 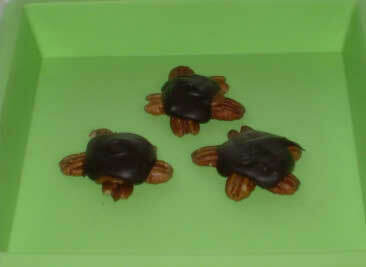 Click here for a link to a caramel recipe that will work for turtles. If you look at the end of that post there are some pictures of turtles under construction. It looks like they have used a turtle mold, painted the eyes, then poured in a layer of chocolate and poured the excess out, then probably taken cooled caramel and pressed it in to the mold and applied the pecan legs to the caramel. I can certainly vouch for Kerry's caramel recipe!! Darienne your turtles are great!! 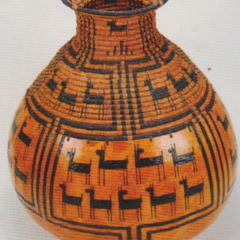 I also make similar ones. And Felipe welcome and good luck with the turtles! Thanks for the words, Lior. It's great fun. Everything is a first for me. My partner, Barbara, was raised in a cake-decorating, candy-making family, but I have always avoided cooking anymore than I had to. Now, in my dotage, something has snapped and I am a kitchen devotee. Thanks for the words, Lior. It's great fun. Everything is a first for me. My partner, Barbara, was raised in a cake-decorating, candy-making family, but I have always avoided cooking any more than I had to. Now, in my dotage, something has snapped and I am a kitchen devotee.